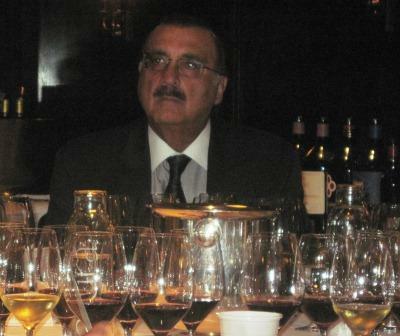 The restaurant Del Posto is so far on the West Side that it’s practically in the Hudson River, but it’s one of the better places in Manhattan to taste wine, I thought, as I seated myself behind an impressive array of glasses and listened to Mario Belardino, President of Bedford Imports and for decades the US importer of Umani Ronchi wines, introduce the winery’s third-generation owner, Michele Bernetti. The occasion was a luncheon to mark Michele’s visit to the US and to introduce Umani Ronchi’s new releases, including the Verdicchio dei Castelli di Jesi Classico Superiore Vecchie Vigne 2009 – Vecchie Vigne for short – which had the enviable distinction this year of being designated not just Tre Bicchieri – honor enough for a white wine from the central Italy’s Adriatic coast – but also being named White Wine of the Year by Gambero Rosso. 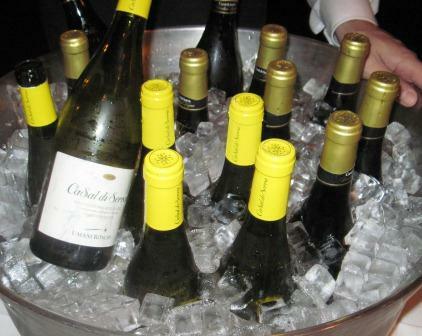 Such a huge award – there is an abundance of prestigious white wines in Italy, after all – will no doubt come as a surprise to most American wine lovers. We are more used to thinking of Verdicchio (if we think of it at all) as a light quaffing wine, to drink at the seashore with a plate of clams on the half shell. Reputations for good or for ill die hard in the wine world, and many wine lovers no doubt still recall the heyday of Verdicchio, almost 30 years past now, when the fish-shaped bottle (Fazi-Battaglia’s specialty) was a ubiquitous sight in Italian restaurants. Verdicchio in those days established itself here as a light-bodied, crisp, and acidic white, perfect, served icy cold, for aperitifs and alongside those raw clams or fried calamari. That peak of popularity passed – they are not long, the days of wine and clams – and Verdicchio-as-aperitif was replaced by other wines, notably Pinot grigio, which became in its turn just as popular. In the meanwhile, in Le Marche, Verdicchio was evolving. The vineyards were getting older, for one thing (vecchie vigne, for instance, means old vines), and delivering richer grapes that were in turn yielding a rounder, fuller wine. And producers were experimenting with aging the wine, in large wood and small, with and without lees. Verdicchio riservas began appearing more and more often. It was a riserva bottle of Umani Ronchi’s Verdicchio Casal di Serra, for instance, that ten or so years ago first impressed me that Verdicchio could be a serious, more full-bodied dinner wine. Indeed, the play of acidity and minerality in the 2009 Vecchie Vigne was quite evident and thoroughly pleasurable both in the bare tasting and at lunch. Combined with Verdicchio’s distinctive fruitiness – an improbable combination of pear and banana flavors (please take that as an approximation, not an exact description) – it made a medium-bodied white wine that could, at a stretch, serve as an aperitif, but really wanted food of a substantial sort alongside it. Del Posto accompanied it – delightfully, for my palate – with a brilliantly spicy Lobster Fra Diavolo. The interplay of the lushness of lobster, the spicy bite of the sauce, and the acid bite of the wine made a perfect combination. And the Vecchie Vigne behaved equally well with the next course, Garganelli Verdi with Ragù Bolognese. This pasta was intended to accompany Umani Ronchi’s red wines, Rosso Conero and Montepulciano d’Abruzzo (good wines both: perhaps more about them in a later post), but I found that the delicacy of the thinly rolled pasta and the succulence of its meat sauce played as well if not better with the parallel richness and leanness of the Vecchie Vigne. In short, the Gambero Rosso people made no mistake: This ’09 Vecchie Vigne is a versatile dinner wine of a complex and highly adaptable character. In fact, I’d go so far as to say that this wine (and a few other Verdicchios I have tasted, notably Bucci’s) makes a real case for Verdicchio’s admission to the exalted category of “noble grape.” It’s a variety that makes a wine of pleasurable complexity and depth, showing a great capacity for aging gracefully and interestingly. It would be worth laying down a dozen bottles of this 2009 and tasting one a year just to see how they develop. A few years down the road, the results could be sensational. P.S. In response to innumerable inquiries (well, one: from my wife), I’ll explain that the name Umani Ronchi does not mean “raunchy humans” but is the family name of the founder of the winery, Gino Umani Ronchi, whom Michele Bernetti’s father joined originally as a partner. 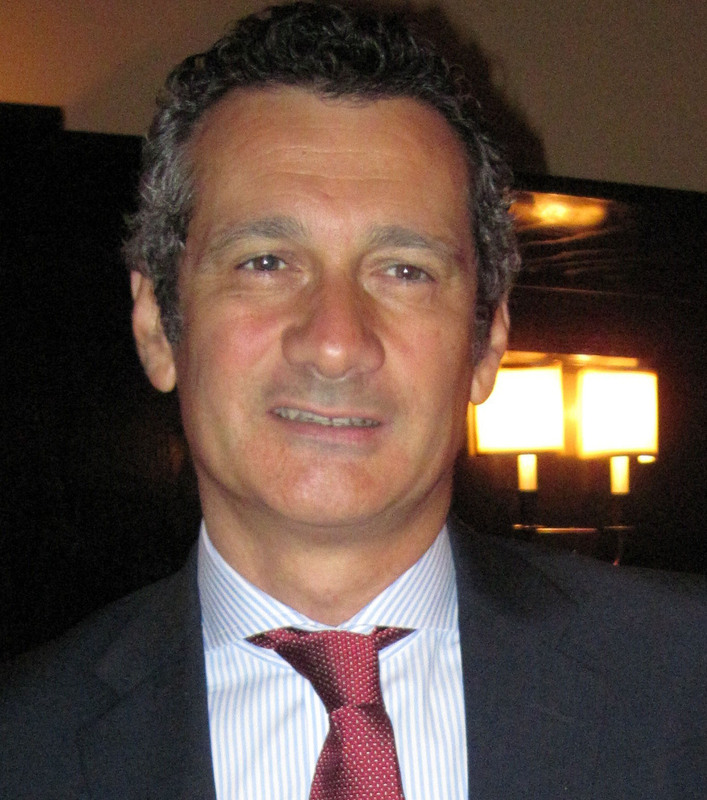 The Bernetti family, now sole owners of the firm, have kept the name to honor his work and because he had successfully established a brand identity in the Italian market.